If you’ve never had a sopapilla then I feel sorry for you. 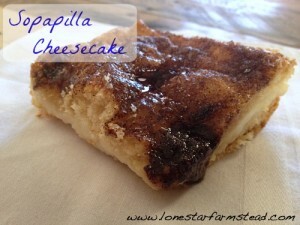 Here in Texas it is a traditional dessert from practically every Mexican food restaurant that has opened its’ doors. It is a fried tortilla sprinkled with cinnamon, sugar, and brown sugar. Smother that in butter, drizzle with honey, and I promise you will think you are in heaven, but if that is indeed heaven, then there must be levels to heaven because this sopapilla cheesecake will make you think you have transcended to a whole new level. Ok. Maybe it isn’t heaven, but it certainly must qualify as the new ambrosia; the sweet nectar of the gods. My sister-in-law made two pans of this for Christmas at my in-laws and we ate pieces while playing dominoes until we were almost sick. It is that delicious. Preheat oven to 350 degrees. Unroll 1 can of dough and place in the bottom of an ungreased 13 x 9 inch glass baking dish. Stretch the dough to cover the bottom of the dish and firmly press the perforations to seal them. In a medium bowl, beat the softened cream cheese and 1 cup of the sugar until smooth. Beat in the vanilla. Spread the mixture over the dough in the baking dish. Unroll the second can of dough and carefully place it on top of the cream cheese layer. Pinch the seams closed. Pour the melted butter evenly over the top. Mix the remaining sugar and the cinnamon and sprinkle it evenly over the butter. Bake for approximately 30 minutes, or until the center is set. Cool slightly, about 20 minutes. Refrigerate for easier cutting. Cover and refrigerate any left overs. This mexican pastry inspired dessert is sure to replace ambrosia in your mind as the new nectar of the gods. For the sugar in this recipe we actually use 1 cup of sugar and 1 cup of brown sugar, blended. We also serve ours warm rather than cold which I think makes it taste about 1000x better. It is also very good topped with a drizzle of honey, which also lends itself a little more authenticity as a sopapilla. I love Texas, lived there for 7 years (Houston, Humle, & Bellaire) & miss it more than I can say. My daughter lives in Richmond though, so I still feel connected back here in cold & wintery NH. Thank you for briging a little piece of my heart back to me today.